Making a Gauge Swatch helps determine stitches needed to tweak a pattern for size, tools or yarn. Used for knitting with needles, loom or even crochet. If the knitter is new, this may take some time to determine but, the best tip is to knit up a 6”x6” swatch. Write down the 1. Needles used, 2. Yarn used, 3. Stitch used; now keep it all on file. Go one step further and measure your swatch then file that with the swatch or keep a record for yourself on a spreadsheet. 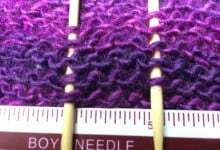 Using a hard ruler or swatch ruler, measure and count how many stitches are in a 4” wide area and then how many rows are in a 4” length area. These numbers will determine a full picture of the final gauge achieved. See our blog for more on calculations for gauge.